No class on: Monday Oct 8th 2018 (Thanksgiving), Monday Nov 12th 2018 (Remembrance Day ). We will give you extra material to do at home these weeks! This class has now started, but you are still welcome to join! We will give you the material missed and your course will be prorated! For those who have already taken four of our weak Intermediate classes, or who can converse comfortably in the present tense, who have a fair range of vocabulary that can be accessed easily without too much thought, but who do not speak perfectly with the past or future tenses, we invite you to join our dynamic Intermediate Class. We are conveniently situated in the heart of Vancouver. 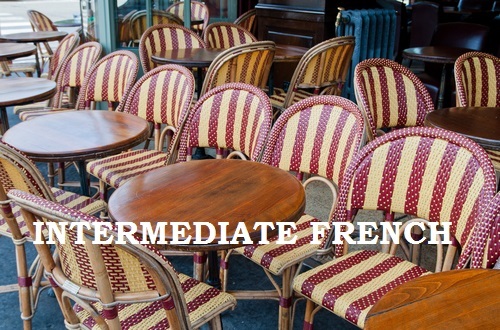 Our lessons will teach you the basics of French grammar and vocabulary with a particular focus on encouraging oral communication. Your teacher is available to answer any questions you may have during the week by email. Please note that we try to update the number of spots left every day but occasionally several people sign up at the same time and there may be fewer spots available than indicated. As there is high demand for our classes and our courses are almost always full up, we recommend signing up at least 5 days before the course begins to be sure that you will have a spot in the class. The $39 deposit is included in the course fee. It is non-refundable but can be used towards any future group class.